Lavenders in high demand. Click for details. Hardy lavender plants selector by height and colour. Take a look. Enjoy gifts and goodies while lavenders sleep! Welcome to our web site where you can shop online for culinary grade lavender plants and rosemary plants and lavender gifts. 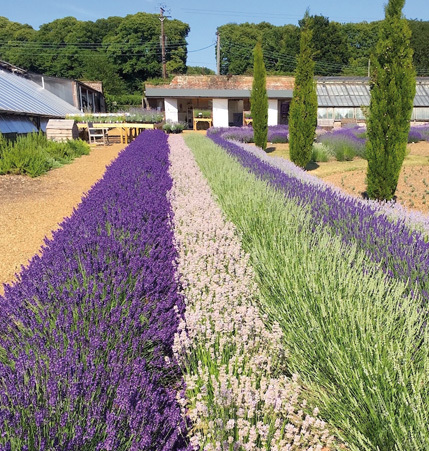 We grow and stock a superb range of lavender plants and rosemary plants selected from our vast collection for their culinary, medicinal and decorative use, which is complemented with a great range of goodies. Treat yourself, loved ones or friends to plants, gifts or a voucher. We hope you‘ll agree that this is the definitive guide to buying these wonderful plants for their flowers, their flavour and the wildlife they attract. If after browsing you‘re still unsure which lavenders or rosemaries are best for your purpose, contact us, we‘d be happy to help. We‘ve many other lavenders and rosemaries on the nursery, including some specimens in larger pots. So visit us online or at our nursery in Kent….and one of the many local pubs for a splendid meal!